Dispatched from and sold by DURONIC. 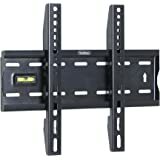 Amazon's Choice for "47 inch tv wall bracket"
Sent from and sold by DURONIC. Sold by PJP ELECTRONICS and sent from Amazon Fulfillment. 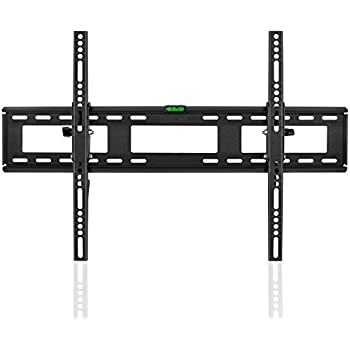 The Duronic TVB777 is a solid TV bracket that will fit all of the major TV brands on the market. 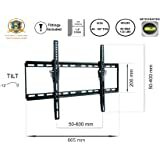 Our TV brackets are made of strong cold steel metal to give the best heavy duty results that customers look for when putting an expensive TV on the wall. Your TV should be a size between 33" and 65"
Have a VESA of MAX 600 x 400. This is the horizontal distance between the holes at the back of your TV x The vertical distance of the holes at the back of your TV. Our brackets include a manual for you to easily follow and install the bracket. It comes with all the screws for fittings that fit 99% of TV's. All you need is a drill, a long screwdriver, and a helper to get the TV up on the wall. Make sure the TV hangs on a solid wall or on a studded wall. It was very easy to put together and to put on the wall. 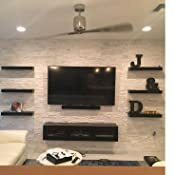 If you are looking for a decent TV wall holder that isn't expensive then this is for you! 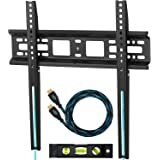 Bought this to put my new 47" TV on the wall. Wasn't sure what to expect for the price but it's excellent. The box contained about 8 main pieces that needed to be assembled but it took me no more than 10 minutes to do. 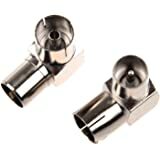 The pack came with a number of different fittings to use on different wall types. Once it was attached to the wall it was very secure. 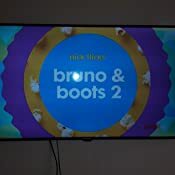 There is a small tilt adjustment on this but I have mine fitted flat and it keeps the TV nice and close to the wall. I've seen brackets for over £100 and I'm not sure why you'd buy one when something like this does the job perfectly for a great price. 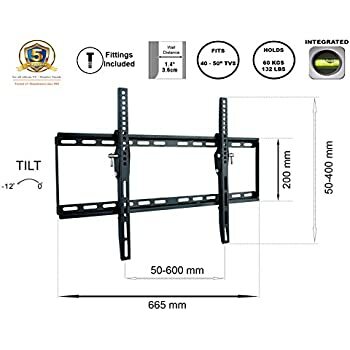 5.0 out of 5 starsGreat value tilting TV wall bracket. 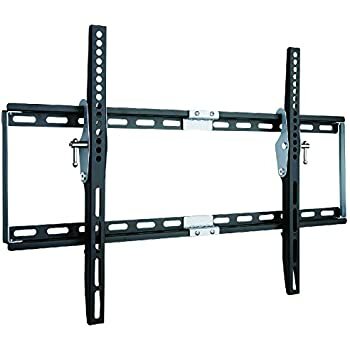 This is a great TV wall bracket. There's a 5 minute Mecanno job to do but it fits together easily. Instructions are clear & all fittings are included, rawl plugs, screws & even a handy clip on spirit level. The tilt function is great if positioned above seated eye level. Advice for easier fitting is to have a 12mm socket handy. You don't need it but it'll make the job easier. 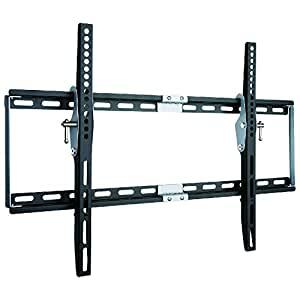 I have used this to hang my 55" TV & contrary to other reviews, it handles it without any issue & it's safe for weight ratio. Great value product. Pretty straightforward to put together, in spite of reviews to the contrary. 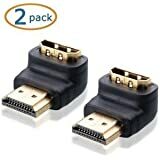 I bought 2; one for a 4 year old 46" Samsung and and for our 2017 model Samsung MU6400 55". 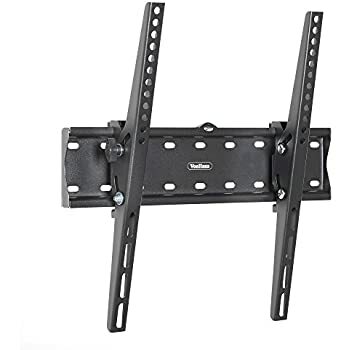 Again, in spite of the reviews saying that these mounts aren't recommended for anything over about 40", they seem to work just fine on my two televisions both of which are larger than that. The pack comes with a few different bolt sizes so that it'll work with several makes and models. However, the largest is a 20mm M8 bolt. That was perfect for my 4 year old 46" Samsung, but the case around my newer 55 inch is quite thick at the bottom edge and required 45mm M8 bolts. But I was able to find some 50mm bolts in homemase and B&Q which did the trick. Just a couple of things to note. 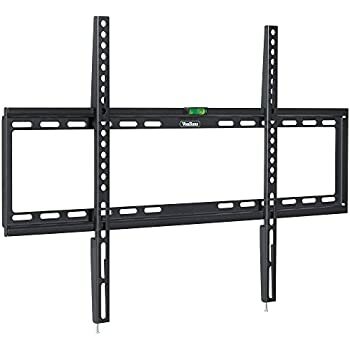 I found that unless you try using the included washers and spacers creatively you can't get the TV square to the wall; the TV angles down a few degrees. If mounted slightly above eye level that is fine. 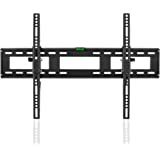 These mounts stick out a few centimetres from the wall so if you've bought one of the top of the range ultra slim tvs that could lie flush to the wall, these mounts aren't for you. Overall though, does the job just fine and half the price of similar looking products from other retailers. Bought this for 40" Sony TV and is now up and stable on my wall. The TV is not going anywhere. This is a self-assembly kit for the most part. 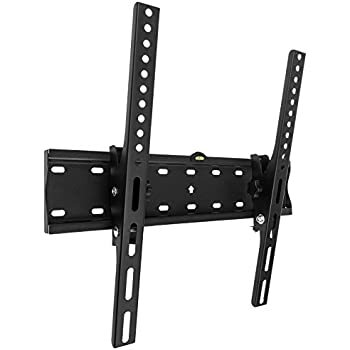 The connecting arms that go on the back of your TV are fully assembled but you have to build the bracket that goes on the wall. I think the instructions could be more clearer - hence the 4 stars. The trick with all the parts and screws, bolts, nuts, washers, etc. is they are paired in the wrapping so each section you build has the bits close together in the plastic bags. It takes a bit of common sense but you get there in the end. Attaching to the wall caused a couple of bolts to break but a quick trip to the local DIY and now bracket is super secure. TIP: The drill bit size is underestimated for the plastic plugs. It says 4mm but I found 6-8mm worked best. Start with the smallest size and work your way up. 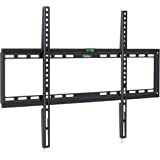 This bracket has tilt functionality and has screws under neath to secure your TV once up on the wall. Happy customer now TV is up - looks great! 5.0 out of 5 starsDoes the job and it does it very well! Excellent mount that's relatively flat to the wall (just on 35mm projection) I couldn't get anything flatter due to plugs etc behind the tv. 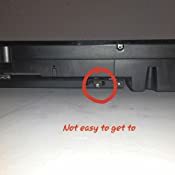 I used this to mount a Samsung ue40k5510 led tv, just be aware that you will have to purchase longer M8 bolts if you have this set as the longest 40mm ones in the pack (there's loads of different bolts and lengths that come with it) aren't long enough. £1.50 from the local hardware shop later and I'm sorted. Love this great value for money and does exactly as I needed it to do. My tv is 50" and my walls are plasterboard and this does just the job perfectly. It's sturdy and easy enough to install my only issue (the same as with my son's one very similar design) is the 2 screws to secure the tv in position (underneath behind the tv) are not easy to get to. The screws require an extra long screwdriver and some determination, when eventually my dad managed it my tv looks great. If it could have something else instead of these screws that would be better but for what it is it is a great product. 5.0 out of 5 starsA very good wall bracket for TV's, which requires assembly. This is a well made wall bracket, but it does take a bit of effort to assemble it. The instructions need to be read closely and followed intently to ensure that all of the pieces fit together as it describes. 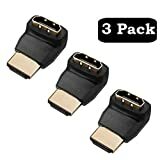 There is reference in the instructions to parts a1, a2 through to part v, but there is no labelling on any of those parts which would indicate what is part a1, a2 or v. It is possible to work out what part is a1, a2 etc., etc., but the instructions need to be read whilst looking at the parts that are contained within the package in order to make sure that they are identified correctly. Having said that, once it is assembled it makes for a solid mounting for, in my case, a 40" TV.